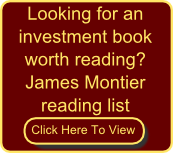 I met James Montier at a value investment seminar in Italy in 2007 where he presented. We had long discussions later the day and into the evening on value investing and investment strategy. James was kind enough to put me on his distribution list and I really looked forward to each of his articles as they always taught me something. Unfortunately James decreased his writings since taking a position with the asset manager GMO in 2010. I decided to put this resource page together so you can also benefit from James’s investment wisdom. James Montier is a member of GMO’s asset allocation team. Prior to that, he was the co-Head of Global Strategy at Société Générale and has been the top-rated strategist in the annual Thomson Extel survey for most of the last decade. He is a Visiting Fellow at the University of Durham and a Fellow of the Royal Society of Arts. In an 12 November 2016 Financial Times article titled “James Montier says nothing is cheap and his GMO is holding cash” James said that no asset class is attractive at the moment except perhaps Emerging Markets and even that is not really an outright buy. Also their $27bn flagship fund is 40% in cash. This June 2015 article titled GMO’s Montier: we haven’t been this risk-averse since 2008 summarises James’s view of how difficult it is to invest in the current highly valued market including the current “stable hell” situation. In this May 2015 article How to invest in a central bank sponsored speculative bubble James Montier gives his ideas on how to invest in the current zero interest rate environment. In a 27 January 2015 article Looking Back at James Montier’s “Perfect” Value Investors Larry Swedroe looks at the performance of the The Perfect Value Investors James Montier identified in 2006. In this 3 December 2014 article called The stock market is hideously expensive James Montier, the outspoken value investor and member of the asset allocation team of Boston-based GMO, talks about dangerously high valuations and the virtues of holding dry powder. At the keynote address at the October 2014 European Investment Conference in London James Montier made an interesting argument saying that shareholder value maximization is “a bad idea.” James said it has not added any value for shareholders and has contributed to such major economic and social problems as short-termism and rising inequality. In this 7 July 2014 panel discussion We will continue to swim in a sea of liquidity James Montier discusses the current investment environment with Felix Zulauf and David Iben. CNN Money interviewed James Montier on 7 May 2014 in an article called Are stocks overpriced? Holding vastly different opinions are two strategists with decades of insight and experience. Richard Bernstein, former chief investment strategist at Merrill Lynch, now an adviser to funds for Eaton Vance, is bullish. James Montier, who helps manage $117 billion at GMO — itself an adviser to two Wells Fargo funds — is bearish. Both make strong arguments — ones that may challenge your view of today’s investing climate. The Economist magazine in its 26 February 2014 article CAPE Fear printed a good summary of James Montier’s article A CAPE Crusader ─ A Defence Against the Dark Arts (available on the GMO.com website – registration required) where James argues that the US markets are overvalued and that the Shiller PE may even be underestimating this undervaluation. Business Insider on 14 February 2014, in an article titled James Montier’s Annotated CAPE Chart Is Brilliant wrote about an insightful chart James Montier used at a presentation in 2011 showing how the market always reverts to the mean explaining why the market is currently overvalued and why future US stock market returns will not be anything to get excited about. Robert Huebscher in a 4 February 2014 article called What Worries Me Right Now uses a few articles James Montier wrote that shows why and how the US market is currently overvalued and returns are unlikely to be attractive. In this 22 July 2013 article James Montier Explores “The Possibility of No Mean Reversion” with almost all asset classes being expensive. In an 18 June 2013 Advisor Perspectives article James talks about, in spite of record low interest rates, Why to Hold Cash. In this 13 May 2013 presentation by James Montier at the London Value Conference: James said that GMO was now 50% in cash as no asset class was undervalued. In a 9 April 2013 radio interview James said that Value investors face a difficult opportunity set as asset prices increase. In a 15 February 2013 article entitled Hyperinflations, Hysteria, and False Memories James Montier explains why, in spite of all the money printing throughout the world it is unlikely to result in hyperinflation. In the article James shows why we have financial repression (a policy that results in consistent negative real interest rates) and what you can do about it. On the 24th of October 2012 James took part in an online conference, hosted by ValueConferences, and addressed the application of his Seven Immutable Laws of Investing to the European stock markets. The great Greenbackd blog on 8 May 2012 published an article called James Montier on why investors struggle to follow the Magic Formula: Cognitive Biases and Behavioral Errors using a previous article James wrote called The Little Note that Beats the Market to explain why investors interfering with the Joel Greenblat’s magic formula does worse than if you would mechanically apply the formula to your portfolio. On 6 May 2012 the Above the Market blog published an excellent short summary of the main points James made in his talk called The Flaws of Finance at the CFA conference. The good Research Puzzle blog also wrote an article on James’s speech called The Flaws of Finance. On 3 April 2012 Frank Voisin in his excellent blog Frankly Speaking revealed a 526 page document – (James Montier White Papers 2002 – 2011) of all the research James has published from November 2002 to March 2011. A great resource, thank you Frank for putting it together. On 12 February 2012 the Financial Times published a great article on GMO and James Montier called GMO investor clued up on human beings. James reiterates the value of applying behavioural finance to your investment decisions and gives a lot of practical advice you can use such as keeping a written record of your investment decisions or your brain will just rewrite history. Benchmark obsession undermines investor returns. In the article James questions the concept of relative performance saying Sir John Templeton was right when he said that the aim of investing was “maximum real returns”. James argues that the decision as to what asset class you should invest in is much more important than what manager to choose. The simple although not easy answer is to use value across a wide range of assets. To buy when an asset is cheap and sell when as it gets expensive. In order to do this you need patience and a willingness to be a contrarian. The 22 August 2011 article Saving your portfolio’s tail – at a price contrasts James Montier view on not buying expensive tail risk insurance to that of Diversified Global Asset management, a Canadian fund manager that successfully used tail risk insurance to hedge his portfolio from the volatility in early August 2011. On 15 August 2011 Jenny Lowe interviewed James Montier for InvestmentAdvisor, part of the Financial Times. The interview is insightful as it talks about James’ new role as an investor rather than a commentator as he did in his previous two bank positions. This January 18, 2011 Bloomberg article titled, Treasuries Are ‘Ugly Sister’ to Overvalued Stocks, Montier Says mentions James’ view that both treasuries and equities are overvalued. He further argued that investors are not compensated for the long-term risk of holding bonds. With 10-year Treasuries yields having fallen to 3.32% from 5.22% in 2006, as investors rushed to buy government-backed notes following market’s plunge from 2007 to 2009. In a January 11, 2011 issue of the Financial Times blog Alphaville titled, Economic forecasting delusions Cardiff Garcia writes about the perils of economic forecasting. He mentions James Montier’s chart on actual Gross Domestic Product results against the consensus forecasts. Interesting to note is that economists have almost completely able to correctly forecasts inflation, bonds yields and economic growth. In this December 22, 2010 GMO White Paper titled, In Defense of the Old Always (free registration required) James Montier defends the relevance of mean reversion. According to PIMCO, the term new normal creates an environment where the consensus expectations has shifted from traditional bell-shaped curves to a much flatter distribution of outcomes with fatter tails. PIMCO wrote that positioning for mean reversion will be a less compelling investment theme in a world where realized returns cluster nearer the tails and away from the mean. James argues mean-reversion strategies are alive and well as long as markets continue to swing from a cheery consensus to gloom and vice versa. On August 31, 2010, James Montier wrote a blog post titled Bond Bubble – a sterile debate on semantics where he addresses the debate on whether the bond market is in a bubble or not. According to James, the real issue should be whether bonds offer a sensible rate of return to long term investors. The valuation of bonds is a relatively simple process having three components: the real yield, expected inflation and an inflation risk premium. It is interesting to note that the market is currently implying a 70% probability that the United States will have a period of zero inflation for the next decade. Cardiff Garcia of the Financial Times’ Alphaville blog in an August 20, 2010 article titled, Of fat tails and mean reversion agrees with James Montier’s argument on the mean reversion and fat tails (see article below). Cardiff writes that James Montier believes that although economic outcomes may have flatter distribution in the past, this is nothing new for asset markets. He also notes that James Montier is part of the asset allocation team of GMO, run by one of the high priests of mean reversion, Jeremy Grantham. In this August 25, 2010 GMO White Paper called, A man from different time (free registration required) James Montier argues that dividends are vital component of investment returns. James explains that the concept of dividends is irrelevant for short term oriented investors. However, to those investors who have longer time horizon, dividends are an important part of the investment return equations. For example, investors who have 5-year time horizon, dividend yield and growth accounts for almost 80% of the return. Finally, he also made a case for European dividend swaps which offer intriguing opportunity as they are still priced for a depression. As ever, patience is necessary as convergence between implied dividends and actual dividends is slow in longer maturities. While implications that historical benchmarks will be challenged and less credit will be available to sustain leverage and high valuations are reasonable, the death of mean reversion appear premature. He argued that the authors are confusing the distribution of economic outcomes with asset market returns. While the distribution of economic outcomes may have a flatter distribution than in the past (i.e., higher frequency of high impact fat tail shocks), asset markets have long suffered such distributions. On his Behavioural Investing blog James Montier on 19 August 2010 wrote Guess Who? where he shares some Keynesian quotes on the limitations of economic theories to practitioners. John Maynard Keynes mentions that mathematical economics are mere concoctions and tends to lose sight of the complexities and interdependence of the real world. In this 28 July 2010 post on his blog titled, Banks and Basel 3: Asking kids to mark their own homework James mentions a Bloomberg article where Westpac Banking Corp. in Australia said that some provisions of the Basel 3 were flawed and risked constraining lenders. Furthermore, James points out that one of the main problems of Basel 2 was that banks were allowed to use their own risk models to value assets. This can be likened to asking kids to make their own marks on their homework. In this 27 July 2010 GMO White Paper titled, Is Austerity the Road to Ruin? (free registration required) James Montier explains the power of the paradox of thrift. The paradox of thrift states that if everyone tries to save more, total income is lowered. If everyone isn’t spending, firms won’t invest since there is no demand for their products. The economy ultimately ends up in a downward spiral. James advises investors to construct portfolios that are protected under a number of different possible scenarios. And to consider cheap insurance in circumstances where they simply don’t know the outcome of events. In this July 22, 2010 post on his blog entitled, On the price of insurance and bull market in tail risk James Montier stresses the need for investors to buy cheap insurance. James has noted that investment banks are launching a lot of new investment insurance products such as Deustche Bank’s long equity volatility index and Citi’s crisis index. The key to buying insurance is that it must be cheap or at very worst fair. Buying expensive insurance is the same as buying an overpriced asset. Rather than wasting money on expensive insurance, he suggests holding cash. On July 7th James started up his blog Bahavioural Investing again which has been dormant since November 2007. Be sure to add it to your RSS reader. In this May 2010 article called I Want to Break Free, or, Strategic Asset Allocation does not equal Static Asset Allocation James Montier talks about in the beginning investing was a simpler and happier. The essence of investment was to seek out value; to buy what was cheap with a margin of safety. Investors could move up and down the capital structure (from bonds to equities) as they saw fit. If nothing fit the criteria for investing, then cash was the default option. But that changed with the rise of modern portfolio theory and, not coincidentally, the rise of “professional investment managers” and consultants. In March 2010 Miguel Barbosa in his Simolean Sense blog interviewed James Montier about his book Value Investing: Tools & Techniques For Intelligent Investing. In the second part of the interview Miguel talks to James about his other book The Little Book of Behavioral Investing – How Not To Be Your Own Worst Enemy. In this February 2010 article, the first since joining GMO, James Montier asks Was It All Just A Bad Dream? Or, Ten Lessons Not Learnt from the financial crisis. In November 2009 article titled Only White Swans on the Road to Revulsion James Montier makes the argument that that the housing bubble and the crisis following its collapse was not an unforeseen event but rather the result of over optimism and the illusion of control, two classic human behavioural mistakes. The financial times in this 24 June 2009 article EMH, AMH: Edwards and Montier ride again motions James Montier leaving Societe Generale to join US investment manager Grantham Mayo Van Otterloo & Co, just after he and Albert Edwards won the Thomson Extel European analysts award in May 2009 as the top global strategy team. In this 2 June 2009 research paper Forever blowing bubbles: moral hazard and melt-up James Montier explored the bubble phenomenon and what happens in the future after a bubble pops. He explores the possibility that all the government rescue packages initiated in 2008 have the possibility to again inflate a substantial bubble. In this 24 June 2009 Financial Times article called Insight: Efficient markets theory is dead. James Montier explains why the efficient markets theory is dead but still lives because of academic inertia. In June 2009 James Montier’s published this list of his Favorite Investment Books as well as a Summer reading list of more recent titles. In May 2009 shortly after the market started its recovery from its March 9 2009 lows James Montier in this article titled Sucker’s rally or the birth of a bull? asks if this is a suckers rally and if so what investors could do to protect themselves. He also gives a few short ideas from his shorting screen. In this 27 January 2009 article Clear and present danger: the trinity of risk, James Montier writes about the three primary and interrelated sources of investment risk; Valuation risk, business or earnings risk and balance sheet or financial risk. In this excellent review of James Montier’s book – Behavioral Investing: A Practitioner’s Guide to Applying Behavioral Finance, Bruce Grantier summarises the main points of the book with emphasis on mistakes and biases followed by a discussion of number of behavioral phenomena. In the article The psychology of bear markets published in December 2009, during the brunt of the bear market James Montier writes about that the mental barriers to effective decision-making in bear markets are as many and varied as those that plague rationality during bull markets but that they more pronounced as fear and shock limits logical analysis. In this 25 Nov 2008 article called The road to revulsion and the creation of value, James Montier argues that the road to revulsion – sharply declining prices – ends in an investment nirvana with unambiguously cheap assets. In this 25 November 2008 Bloomberg article Montier Has ‘Never Been More Bullish’ on Stocks James Montier makes the cast that stocks are “distinctly cheap” because they trade at 15.4 times the 10-year moving average of its companies’ profits, compared with an average of 18 for the U.S. market since 1881.James wrote that fifteen stocks in the U.S. index, pass his test for “deep value,” while a tenth of shares in Europe and a fifth in Asia qualify. In this 27 October 2008 article – An admission of ignorance: a humble approach to investing James Montier details his investment strategy. It makes no sense to forecast, the importance of a margin of safety, avoid trying to time the market and buy cheap insurance. But most importantly, humility should be the central theme of a good investment process. In this October 22nd, 2008 Financial Times blog post by Paul Murphy summarises an article Analysts are rubbish by James Montier about the bullish bias built in to the investment industry by the analysts and that analysts are exceptionally good at one thing and one thing only – telling you what has just happened. In this 9 September 2008 article – The dangers of DCF James Montier writes about the dangers Of Discount cash flow (DCF) saying its implementation is riddled with problems but the good news is that several alternatives exist. In this 23 June 2008 article – You are still wasting your time, or, are analysts just overpaid secretaries? James Montier writes about the whether company visits are useful for fund managers. The answer in general is no but they can be improved by learning to look for evidence that disagrees with us, and seek to disprove our ideas, rather than illustrate them with supportive evidence. In this article The Road To Revulsion 16 June 2008 James Montier writes about bubbles, that bubbles are a by-product of human behaviour, and that human behaviour is sadly all too predictable. The details of each bubble are different but the general patterns remain very similar. He also touches on the propensity for commentators to continually proclaim the end of the problem and a resumption of business as usual. In the 30 May 2008 article Inflation Not The Problem Albert Edwards and James Montier explain why they are sceptical of all the market commentators saying that the worse market decline of the recession was over. How right they were, but it’s the way they arrived at their conclusion that makes the article worthwhile reading. If you have any interest at all in short selling this is an article for you. On 26 May 2008, with the markets particularly overvalued James Montier turned his thinking to short selling writing Joining The Dark Side: Pirates, Spies and Short Sellers. In the article he explains a simple short screen with surprising results shown through back testing in the USA and Europe. In the article with the catchy title Asleep at the wheel, or, How I learned to stop worrying and love the bomb published on 7 April 2008 James Montier points out that company management and analysts are unwilling to revise their profit estimates in spite of the looming recession as everyone thinks their business is recession resistant. He points out that this is why they are all overoptimistic and how you can avoid falling into the same trap. In this 13 March 2008 research article called Remember, Cassandra was right! James Montier makes a strong argument that the mess in the US economy and housing market was not caused by a black swan event (unpredictable) but rather was sadly predictable. It follows the standard pattern of a bubble deflating, some thing that we have seen a thousand times before. On 12 January 2008 James made the last post on his blog called Behavioural Investing – The application of psychology to finance and the home of an investing sceptic. The articles he wrote is luckily all still there and it’s a real treasure trove of information. In this 15 January 2008 article The Dash To Trash And The Grab For Growth James Montier wrote just shortly after the absolute peak in the 2008 bull market he suggests that if you cannot move to cash because of career risk then invest in large dividend paying companies as what is going to happen to growth stocks at already high valuations is not going to be pretty. How right he was. In this blog post called The Sources of Value, written in October 2007 James Montier analyses which of the component sources of return leads to value, over reasonable periods of time, to outperform growth? On 3 October 2007 James Montier posted a blog article titled Sector rotation: an investment dead end? He argues that investors focusing on sectors rather than stocks are barking up the wrong tree. James Montier’s book Behavioural investing: a practitioner’s guide to applying behavioural finance was published in September 2007. At the link above you can read parts of the book at Google Books. In this 24 September 2007 blog post called The myth of exogenous risk and the recent quant problems James Montier argues that many aspect of investment risk are endogenous (like a gambler playing poker, where the actions of the other plays are integral to the game) to the way in which we invest. The problems experienced by the quant funds in August may help highlight some of these issues. In this 10 September 2007 blog post Yet more evidence on the folly of forecasting, or why we don’t need economists! James Montier presents even more evidence that humans cannot forecast and why you should avoid listening to anyone who says he can as well as avoid it yourself. On 21 August 2007 James Montier posted a blog article titled Earnings manipulation as a source of short ideas. He identifies shorting candidates through a measurement called the M score. Past results are impressive in identifying under-performing companies. On 15 March 2007 James Montier posted a Macro Research article titled Global Equity Strategy . Investing 101: A reading list. Here he comes up with a collection of his best books in different categories (classics, modern, psychological and hidden gems) that is arguably the best reading list for any aspiring investor. In the 30 January 2007 article by James Montier CAPM is CRAP James says that the capital asset pricing model (CAPM) is insidious. It creeps into almost every discussion on finance. And them he goes on to systematically take the model apart with real life examples and evidence. In his 10 January 2007 research paper Contrarian or conformist? James Montier, in his usual style puts himself against the common view saying that the then biggest consensus portfolio bets to him seemed to be small cap and low quality however large cap, high quality looks like the better bet to him. To emphasise he quotes Sir John Templeton once observed, “It is impossible to produce a superior performance unless you do something different from the majority”. In this 30 November 2006 article with the enticing title Improving returns using inside information James Montier explains the results of a unknown but interesting research paper on share buybacks and how they, when implemented, are a powerful indicator for positive returns. closet indexing accounts for nearly one third of the US mutual fund industry. Stock pickers account for less than 30% of the market, yet they have real investment skill. A fascinating read. The article Prophet Among Pinstripes in the April 2006 issue of Fastcompany magazine features James Montier where he gives his five laws about investing bias, evolution, and true happiness. beats the markets by around 7% p.a. between 1993-2005, and with lower risk than the market! Value plus quality seems to make sense. In the article Behaving Badly published in February 2006 James Montier features a short test you can take after which you will also become a strong believer in behavioural finance. Give it a try! In November 2005 James Montier wrote the article Seven Sins of Fund Management – A behavioural critique where he explores some of the more obvious behavioural weaknesses inherent in the ‘average’ investment process. For example he writes that the first sin was placing forecasting at the very heart of the investment process. An enormous amount of evidence suggests that investors are generally hopeless at forecasting. So using forecasts as an integral part of the investment process is like tying one hand behind your back before you start. In this 31 March 2005 article called Bargain Hunter James Montier confesses that he is an unabashed value investor. He adds that if the reader does not share this viewpoint, or isn’t open to be persuaded of the merits of such an approach, he should stop reading now for what follows will only distress his. James teams up with Rui Antunes his “usual accomplice and compatriot in adventures involving large amounts of data” and embarked upon an investigation of value strategies. In the article Abu Ghraib: Lessons from behavioural finance and for corporate governance, wrote at the end of January 2005 James Montier says even though it is tempting to believe bad behaviour is the result of a few rotten individuals. However, the overwhelming psychological evidence suggests that if you put good people into bad situations they usually turn bad. In the June 2004 paper If it makes you happy James Montier leaves investment advice aside and explores one of Adam Smith’s obsessions: what it means to be happy. James’s top ten suggestions for improving happiness. In the article Who’s a Pretty Boy Then? Or Beauty Contests, Rationality and Greater Fools James Montier in February 2004 played a classic Keynes’ beauty contest with over 1000 professional investors. He found that on average professional investors are using between one and two steps of strategic thinking in forming their expectations. He also found that many investors suffer the curse of knowledge and end up either picking zero or severely underestimating the irrationality of other players. These results speak directly to the ability of investors to exit the market before the mass exodus. He found, unsurprisingly, that only a very small minority shows the required level of strategic thinking to beat the gun. In this 76 page presentation Insights into irrational minds and market Applied Behavioural Finance: Insights into irrational minds and market James Montier gave in 2004 he in great detail described the behavioural biases investors are prone to. Its a great summary of a lot of his previous work in a presentation format, summarised in bullet points and graphs. This November 2003 issue of welling@weeden James Montier offers a reality and earnings checks. In this January 2003 research paper Running with the Devil: The Advent of A Cynical Bubble James Montier explores the nature and underlying psychology of four different kinds of bubbles. To assess which comes closest to describing the current market. To us, the current market environment is largely a greater fool market. Because such markets lack fundamental support, they are liable to precipitous declines. In Darwin’s Mind: The Evolutionary Foundations of Heuristics and Biases James Montier in December 2002 writes that a catalogue of biases that cognitive psychologists have built up over the last three decades seem to have stem from one of three roots – self-deception, heuristic simplification (including affect), and social interaction. In this paper James explores the evolutionary basis of each of these roots. The simple truth is that we aren’t adapted to face the world as it is today. We evolved in a very different environment, and it is that ancestral evolutionary environment that governs the way in which we think and feel. In 22 November 2002 James Montier wrote in Part man, part monkey that leaving the trees could have been our first mistake. Our minds are suited for solving problems related to our survival, rather than being optimised for investment decisions. We all make mistakes when we make decisions. The list below gives a top ten list for avoiding the most common investment mental pitfalls.